except a 15-day-close down during Spring Festival. We would like to show the pens Market to you. Yiwu has been strong in pen manufacturing for more than 20 years. Its pen parts and pen accessories also take up over 70% of China market share. Over70% of China pen accessories and parts pen refills pen points are sourced from Yiwu. It is one of the largest pen wholesale market in China and the strong manufacturing ability market. Around 2000 shops are cubed inside Yiwu international trade city. Other shops scattered out in the streets. The international trade city is the place where overseas buyers go most. Fountain pens, ballpoint pens, ink pens, calligraphy pens, pencils, promotional pens… pens within your imagination or beyond your imagination, are all displayed here. Over 70% of them are for exporting. If you are looking for cheap price, high quality, different models, come to Yiwu pens market. You will not be disappointed. Besides variety, the creativity of China pen producers also attracts buyers’ eyeballs. You can see a few really creative stuff in the market what’s New and What’s Hot section at the bottom of this page. Around 70% of suppliers inside Yiwu market are factory direct sale. Agents take a 28% percent, including an 8% percent of general agents and exclusive distributors. The variety of the pens is beyond one’s imagination. Small mixed orders are very easy here. Some buyers from the small company and some just want to have a try order, so they don’t want to place a large order. The mixed designs and mix colors is allowed here in shops. But the minimum order quantity is very different from shop to shop here. 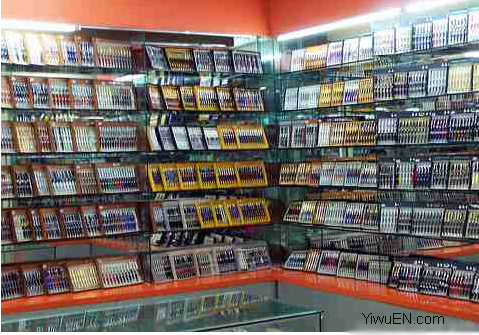 We are Yiwu agent, if you need any help ,please feel free to contact us, we could be you Yiwu pen market agent.